Summer is the season of adventure. You spend your days in the sun and your nights becoming enchanted with new loves, preserving fleeting experiences, and making memories with your favorite friends. 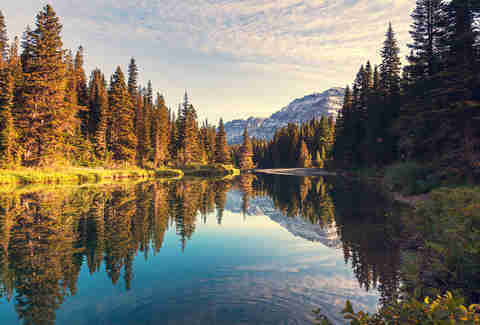 No better place for all three than the wilderness of your favorite hiking trails. They’re beautiful, they’re all unique, and they get you outside. Many of them are also free, which we can’t say for your third Moscow mule last night. Do yourself a favor: This summer, go on an adventure and hit the trails. Here are some of the best places in America to go hiking. The sheer diversity of landscapes in Olympic National Park feels like a video game world map. In a day you can journey from glaciers to rain forests to an alien coastline, all just two hours from Seattle. Its nearly 144,000 square miles host three separate ecosystems. Most of the park is only accessible by foot, making it the perfect place to escape civilization. Its deepest sections can take literally days to get to. The easiest and most unique route is the Hall of Mosses, where sheets of thick, green moss drape over ancient trees. 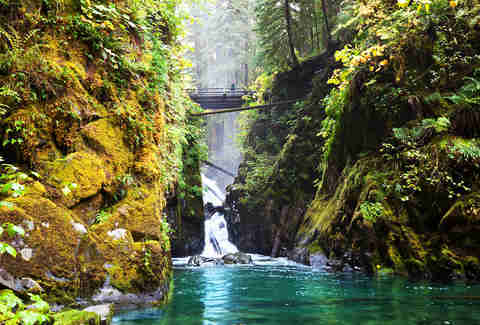 It’s classified as a rain forest, and is the closest thing you’ll find to a tropical paradise outside of the tropics. The trail isn’t even a mile long, meaning you can make it back home well before sundown. 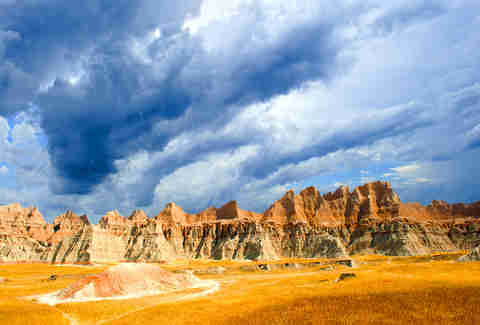 Speaking of video game world maps, you won’t find any natural formation that looks quite as artificial as the Badlands. 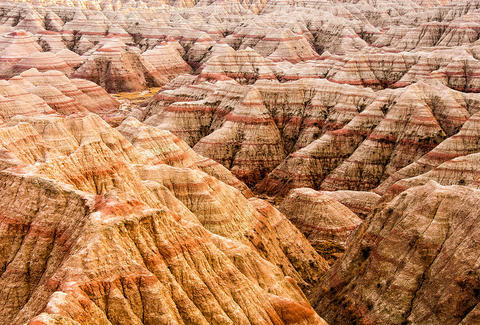 Their undisturbed prairie grasses are surrounded by impossibly steep sedimentary rock buttes, defined by their streaky layers of pink, beige, and orange. The sharp height difference creates a unique landscape and awesome trails. Shade can be hard to come by in the Badlands, so there’s no such thing as a leisurely hike here. But beginners would do best with the 4.5-mile Medicine Root Loop, which offers killer views of bison herds and the rocks along its modest length. If you want a workout, try the Saddle Pass trail, a quarter-mile hike that has you climbing boulders. The monstrous, 2,200-mile Appalachian Trail is best known for the through-hikers that conquer its entire length. Such a journey can take the better part of a year, but the less heroic among us can opt for a day hike. You can easily hop on the trail at any number of small mountain towns. Our recommendation? Damascus, Virginia. Its Biblical name is fitting, as it serves as a sort of holy ground for Southeast hiking. The town hosts an annual “Trail Days” festival, and its restaurants and bed and breakfasts are tailor-made for adventurers. 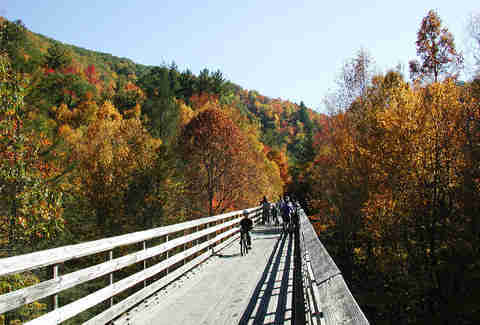 It also intersects with the Virginia Creeper Trail, best experienced on a bike, traveling leisurely downhill. You can rent bikes in town, then return them before a midday hike. 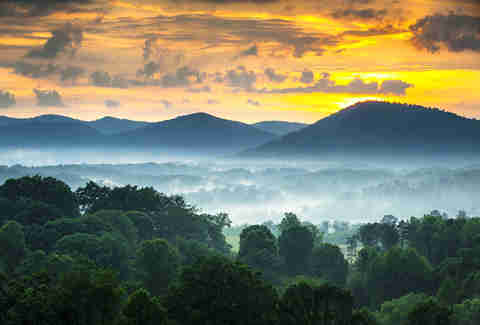 The Rockies may be famed for their distinctive sharp peaks, but the older Appalachians carry a unique, almost mythic quality. With a source on the fittingly named Grandfather Mountain, the Linville River forms one of the most gorgeous gorges east of the Mississippi. But don’t believe us, believe Hollywood: This setting was the backdrop for several scenes in The Last of the Mohicans. The falls make for the perfect day trip. 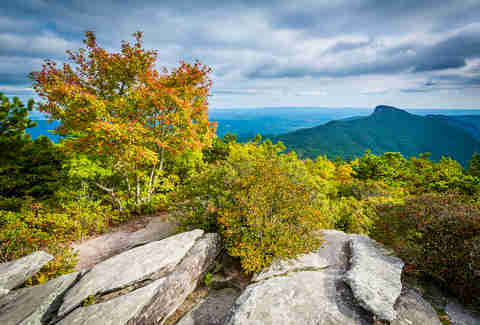 Novice hikers can start in Boone or Blowing Rock and follow the Parkway to Mile Marker 316. From the parking lot you have two options: up to Erwin’s View (for gorge views and rarely tread rock-climbing opportunities) or down the Plunge Basin Trail (for an ant’s eye view of the falls.) Both trails are pretty friendly. If you fancy an overnight stay, you can camp in the gorge with a permit. All that talk of waterfalls may have inspired dreams of sunbathing on a rock with the roar of rushing water. Linville Falls itself is blocked off to visitors, but your solution lies only a few hours South in Pisgah National Forest. The forest’s 500,000 acres are home to your usual trails and peaks, but the real attraction is in the waterfalls. Pisgah hosts dozens of waterfalls, big and small, and many of them are only a short hike from major roads. We recommend Sliding Rock, a natural waterslide that ends in a deep pool (we also recommend you wear heavier clothing to protect your nether regions.) If you want less sliding and more swimming, you’ll find the idyllic Looking Glass Falls a perfect place for an afternoon dip. You can cap off the day in Asheville, home to some of the finest food, music, and drink that North Carolina has to offer. Where to even begin with Yellowstone? You could hike its land for a lifetime and never uncover all of its secrets. Trekking in the shadow of El Capitan is a quintessentially American experience. 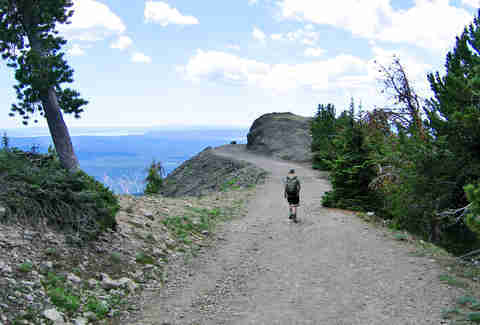 But most people don’t have a lifetime, and for a day hike you can’t go wrong with the Mount Washburn trail. The 6.4-mile trip is a greatest hits of Yellowstone panoramas, with stunning views of Bighorn sheep and wildflowers. The elevation change is much less dramatic, making for an accessible hike that rewards you with a view from 10,000ft. If you’re feeling a shorter hike, you can drive to a starting point a few miles up the trail. Though hiking on the actual glaciers is very dangerous, you can get prime views of them in Glacier National Park’s namesake – 25 icy glaciers – especially on the Grinnell Glacier Trail. Its shimmering mass stands above an otherworldly blue lake, a hard-earned reward from a 9.8-mile journey. Chief Mountain’s distinctive, table-like silhouette is also worth a visit. You better get out there while it lasts; climate scientists estimate that current patterns could destroy the glaciers by 2030. Central Oregon’s high desert is not a friendly place. 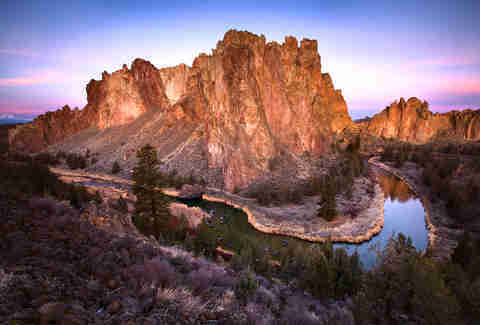 Miles of rolling hills, barren shrubs and poor shade don’t exactly scream “outdoor fun.” This is why Smith Rock – a monument in the middle of nowhere – is so special. The rock itself is somewhere between a mountain and a mesa, surrounded by a winding river and some of the greenest parts of Central Oregon. It’s an American oasis. Camping and hiking opportunities are plentiful around the Rock. The Summit Loop is your best bet, a 7-mile all-arounder that isn’t as steep as it looks. Climbing is also a huge draw; the particularly grippy rock is ideal for climbers of all skill levels. If that’s not enough to convince you, the nearby town of Bend hosts an astonishing 28 microbreweries. Cheers! The Ghost Towns of the west are truly eerie places, and offer glimpses of a world we left behind. 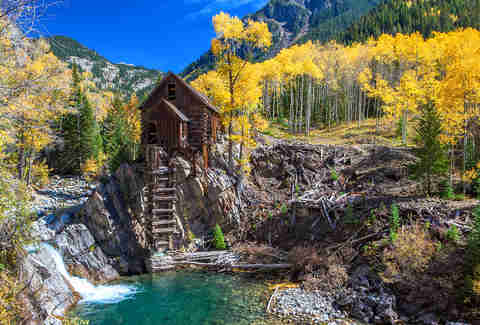 Your average city slicker won’t see much of them, which is why Crystal Mill is such a unique experience. Its hobbling, seemingly impossible exterior looks straight out of a fantasy novel. It’s a bit of a trip from Denver – around 4 hours – but unlike anything you’ll find back home. When you think of the Midwest, “quality hiking” may not be what first comes to mind. 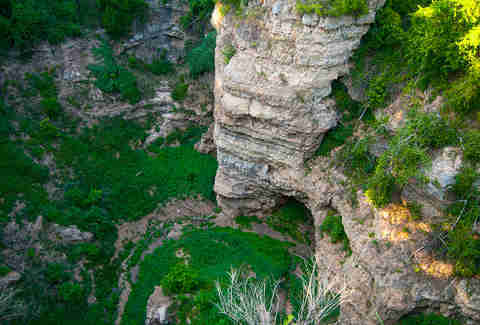 But deep in the Ozarks – one of America’s most overlooked mountain ranges – lies Grand Gulf, a stunning collapsed cave that has formed a massive natural bridge. Often called the “Little Grand Canyon,” it’s a doable day trip from St. Louis and Memphis. The quarter mile Interpretive Loop Trail is mostly wooden catwalks, making it the easiest option. The slightly more strenuous Natural Bridge Trail takes you closer to the Gulf’s edge. If you really want an adventure, you can take the “unofficial” path to the canyon’s bottom, where you can walk over a mile surrounded by 130ft walls. 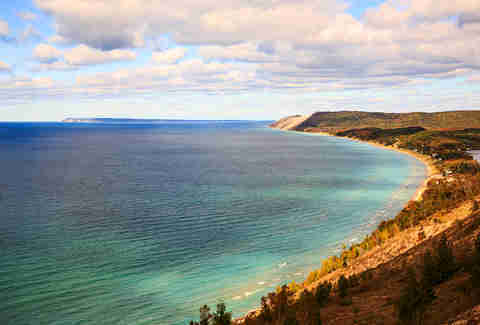 Peaceful Lake Michigan’s Sleeping Bear Dunes get their namesake from a much less peaceful legend. The stories tell of a mother bear and her two cubs who attempted to swim from Wisconsin to Michigan in search of food. Only the mother made it, and Manitou – the fundamental life force in Algonquian mythology – created two islands to mark where they drowned. For the mother, he created a single, giant sand dune. The dunes of today are more numerous and spread out, and present challenging hiking opportunities. The most strenuous trail is arguably the Dunes Trail, 3.5 miles of slippery sand and steep climbs. If you want a great view in a hurry, we recommend the Empire Bluff trail, which leads to an excellent view of Lake Michigan. On a clear day, you can even see the islands from the legend. Jon Dantzler is the world's premier tortilla chip enthusiast. He'd love to talk with you about your overclock settings, gear ratios, and the meme marketplace. You can see pictures of his fiancee and cats on Instagram.